The whole team with Elgin—Middlesex—London MP Karen Vecchio! 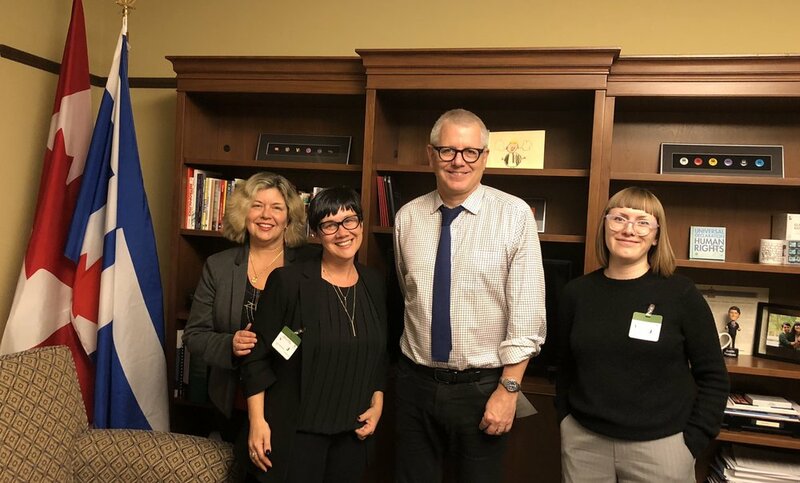 Last week, members of the Time to Attach team went on a whirlwind trip to Ottawa to meet with several MPs and policy advisors. They had one objective: to advocate for a new class of employment insurance benefits for adoptive parents, customary caregivers, and kin caregivers. The research team at Western University and its main partner, Adopt4Life: Ontario’s Adoptive Parents Association, have been building an argument to offer adoptive parents and kin or customary caregivers an additional 15-week leave. This “attachment leave” would allow for more time for children to attach to their parents or caregivers, and to address the unique needs of these families. As part of their research, the team at Western surveyed almost 1000 adoptive parents, kin, and customary caregivers. Approximately three quarters of respondents felt that the current employment insurance benefits, which only offers 35 weeks of parental leave to adoptive parents, did not give them or their children enough time to adjust to their new family. Researchers also asked survey participants about the complex challenges that their children experienced, such as navigating an openness agreement with birth parents, mental health challenges, or a physical disability. 84% of respondents reported 2 or more significant challenges, and an astounding 40% of respondents reported 5 or more. The team argues that these survey results support the need for an attachment leave, as do various political, legal, and economic considerations. They note that although the current EI parental leave benefit system acknowledges the unique challenges faced by biological parents, it does not acknowledge the unique challenges faced by adoptive parents. One reason for this oversight may be that there is a general misunderstanding about the realities of adoption. The team had 9 in-person meetings in Ottawa and several additional tele-conferences last week. They were accompanied by the executive of Adopt4life and the Adoption Council of Canada, including Murphy. The feedback was overwhelmingly positive, with support from MPs across the political spectrum. Karen Vecchio, MP for Elgin-Middlesex-London, tweeted, “One of the best meetings I have had as a MP. I learned so much and was so grateful to hear how your organization helps families. Truly amazing!” The team plans on returning to Ottawa in February to release their report and solidify support from MPs. For more information, please contact ToAttach@uwo.ca or visit timetoattach.com. In August 2007, Patti Tomasson adopted two children. As a new parent, she received standard parental leave benefits: 55% of her insurable earnings for a maximum of 35 weeks. At the time, Tomasson also applied for an additional 15 weeks of maternity benefits. This application was denied by the Employment Insurance Commission on the grounds that these benefits are only for biological mothers. Tomasson appealed the decision to the Federal Court of Appeals (FCA), arguing that to deny her these benefits was discriminatory. According to Tomasson, the Employment Insurance Act treats biological and adoptive parents unequally, and, consequently, unfairly. The FCA responded by justifying the inequality on the grounds that biological mothers require additional leave time “in order to cope with the physiological changes that occur during childbearing” (Tomasson v Attorney General of Canada, 2007). The Supreme Court of Canada upheld the FCA’s decision. The current EI benefits structure does not treat the decision to grow one’s family through adoption equally as the decision to do so biologically. Thus, through this structure, the federal government treats these families differently on the basis of family status or, in other words, on the respective ways in which they have chosen to grow their families. While settling a new child into one’s home is challenging for everyone, this process is especially difficult when the child or youth came from a previous home or environment and is now having to adjust to an entirely new one. These challenges are also exacerbated when the child or youth has experienced trauma, particularly the kind that fragments one’s sense of security or ability to easily place trust in adults. The legal discrimination in the EI benefits system has tangible consequences: adoptive parents are eligible for less leave time, and thus have a shorter window of opportunity to bond with their children and for their children to attach to them. This can jeopardize the likelihood that the placement will be permanent, putting the child at risk for long term instability. In addition to these material consequences, by failing to recognize the distinct challenges faced by those who decide to form their family through adoption, and their significance for the long-term wellbeing of adoptive children and their families, the Canadian government sends a message that these families are not as important or are second best to biological families. In short, the failure of the federal government to consider equally the unique challenges that adoptive families face is discriminatory. This discrimination, in turn, reinforces the view that adoptive families are second best to biological ones. Rectifying this discrimination, then, is a crucial step toward creating a fairer nation for all families, regardless of how they were formed. A version of this piece can also be found at impactethics.ca.